Macherey Nagel ECO iron test kit. Code 931026. This kit tests iron in the range 0.0 - 1.0 mg/L with steps of 0 ? 0.04 ? 0.07 ? 0.10 ? 0.15 ? 0.20 ? 0.30 ?0.50 ? 1.0 mg/l Fe. Both soluble Fe2+ and Fe3+ are measured. 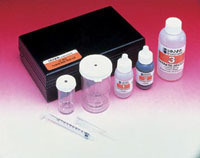 The kit will perform 100 tests and is suitable to test for iron in drinking water.